Caecilians are amphibians which look like an earthworm or a snake. They mainly hide in the ground, that is the reason why they are the least known amphibians. They live in the tropics of South America, Africa and South Asia. We do not really know what they eat, but the adult carnivorous Caecilian seems to eat insects larvae, termites and earthworms. Caecilians in captivity are fed with earthworms and these worms are found easily in the Caecilian’s habitat. They have no legs. Most of them are between 5 to 14 inches (13 to 36 cm) long and 1/4 to 1 inches (0.6 to 2.5 cm) in diameter. 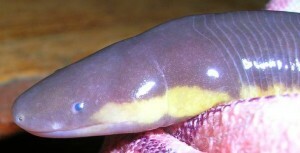 The largest species, Caecilian Thompsoni will grow up to 1.5 metres (5 feet) long. They have no tail or else just a short tail. They have smooth skin and it is usually dark in colour. But some species have colourful skins – orange and grey with yellow stripes, or many other colours. The skin has lots of ring-shaped folds, making it look like they have segments, like an earthworm. The skin contains poisonous glands to defend themselves from predators. There are scales inside their skin. Their bodies are made to burrow well into the ground. They have a strong skull with a pointed snout which they use to force their way through the soil or mud. Their muscles are adapted to pushing their way through the ground. In water or very loose mud, they swim like an eel. They have a fleshy fin along the rear section of their body which help them to swim when they need to. Since they live underground, their eyes are small and are covered with skin for protection. That is why they were thought to be blind. They aren’t blind, but their vision is limited. They cannot see shapes. All caecilians have a pair of tentacles, located between their eyes and nostrils. The caecilians use these tentacles to smell. Most caecilians have lungs, but they also use their skin or mouth to breathe. There are two species which have no lungs. They are Atretochoana Eiselti and Caecilita Iwokramae. About 25% of caecilian species lay eggs that are guarded by the females. For some species the young caecilians already have adult-shaped bodies when they hatch, but others hatch into larvae. The larvae are not fully aquatic. They spend the day time in the soil near the water. The other 75% of the species give birth to already developed babies. The fetus is fed inside the female. Caecilians can live 5 to 20 years.